The (Digital) Future of Imagination? Loo Zihan painstaking edited the documentation of Cane over several weeks to deliver his promise of making it accessible online, to feed hungry netizens like myself. We wanted to devour the work, seeing no need to be at the actual event since it was made available: free, and at our fingertips. Would he have thought of the possibilities of broadcasting the performance “live”? After all, he stated during the performance that everyone was welcome to provide his or her account of the performance online and to ‘check‐in’ or tweet about it real‐time. The artist was aware of how social media and technology has altered the landscape of performance art, and how the work extends far beyond the walls of the Substation Theatre, transmitted to the private space of our bedrooms. So what are the implications of social media and how has performance evolved from the pure ephemeral experience of the Now, to a mediated or delayed version of the original? Performance art has always been entangled with documentation. Brother Cane (1994) and its offspring Cane (2012) are a fine example of this relationship. At the core of the work lies the article “12 men nabbed in anti gay operation at Tanjong Rhu” published in the Straits Times in 1993. Artist Josef Ng reacted to this in his piece Brother Cane (viewed as a reaction to the shaming of the men in the article). The newspaper clipping (presented during the performance) granted the audience access to the context of the work. Post performance, Brother Cane was then widely and sensationally reported in local newspapers: The New Paper, Shin Min and Lianhe Wanbao. Subsequently, the National Arts Council came up with a statement that lead to the ban of funding for Performance Art for 10 years. To Alfian Sa’at in a poem addressed to the artist, The New Paper’s story “highlighted one minute of your twenty‐six minute performance”, a largely biased account of the intention of the work, it focused only on the “indecent act” of snipping pubic hair. 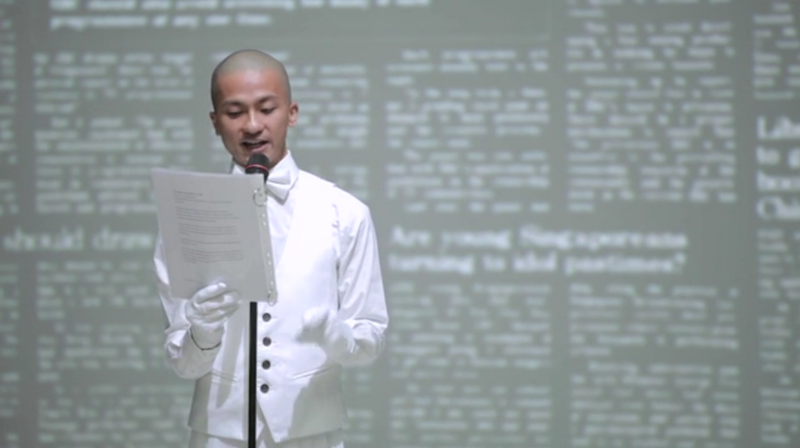 Reportage propagated the performance, fuelled unhappiness and debate, and ultimately documented an important moment in Singapore’s art history. Zihan’s Cane then relied on the eyewitness account by Ray Langenbach. Langenbach’s dissertation, Performing the Singapore State: 1988 – 1995, historicizes a series of important performance art events in the mid‐1990s in Singapore, at 5th Passage, the art space (and collective) formerly run by Suzann Victor and her colleagues where Brother Cane was performed. Zihan’s Cane referred to Langenbach’s account and documentation as the main material for the re‐enactment of the work. An intrinsic part of Cane was the addressing of these layers of documentation, or accounts, through which the performance was structured. These six accounts consist of the Singaporean media, the trial affidavit, two re-enactments, video documentation of Brother Cane and a post show dialogue with the artist, for which Josef Ng did not turn up. Ironically, Cane has now been reviewed (and documented) as “theatre” in the local press and issues have been raised about how the original raw and reactionary work has been manicured (like a cleanly shaven crotch) to high art, “a neutering of the work for consumption by a new generation of audiences” said a writer for The Straits Times. If Cane was to be a litmus test of Singapore’s current art scene, it is also a test of how media has moved on from being highly one‐sided and State controlled to a social network that contains self regulated, increasingly intellectual discourse. Back in the days of Brother Cane, the public reacted to the performance purely based on the newspaper, without knowledge of or access to the actual performance or intentions of the artist. There was a lack of public discussion, and Josef Ng probably couldn’t clarify his intentions as he had no clear forum to do so. Now, Zihan’s Cane has been widely discussed and criticized even before the show began. Touching on that important moment in Singapore’s history, Cane created a lot of buzz over social media (largely Facebook) that overtook the local newspaper as a platform for reportage, discussion or publicity. The Straits Times even referred to this platform to generate its own content. Two particular threads on Facebook stood out, one started by The Substation, and the other by Zihan himself, a “Valentine’s day love letter” to his audience, as blogger/arts reporter Mayo Martin puts it. This note clarified his intentions about the work. 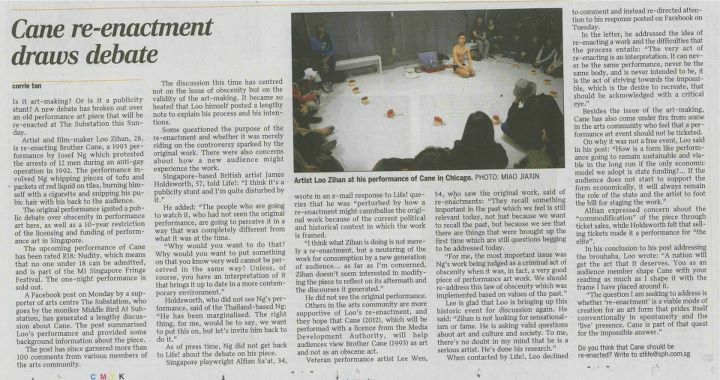 And even before the work was staged in Singapore, the audience could also refer to an earlier version of it that Zihan presented as part of his Masters thesis in Chicago, Cane 2011. This discussion and debate helped the local community to thrash out their thoughts about Zihan’s controversial work, and to converse directly with the artist (though you had to be his friend on Facebook to do so). This also helped the artist to frame and finalize the form of his performance. It points to a new network and growth in artistic discourse that’s so important to any art form, a forum for free discussion and critique, which is neither controlled nor mediated. To me, Cane functioned as a unique example of a work that was formed purely from documents, a hall of mirrors. This also highlights the significant change in performance‐based art with its newfound accessibility. The “idea of the performance” comes before the actual performance of the work. We talk about it, imagine it in our heads. Performance art used to be all about the ephemeral experience and “being there”, but now it doesn’t really matter if I was one out of the 70 attending the performance or not. I encounter the work on my laptop and write about it. The discussion of the work on social media becomes an extension of the work, performed by the thousands of people online like myself. Cane has even been able to reach a worldwide audience. It may be a work born of unique context and controversies, but it does serve as a reference point for artists looking at new media as an opening for new possibilities for their work. Performance art has a love-hate relationship with documentation, purists believing that documentation can never be the work, and that the work has to be experienced “live”. In the 1960s, when the Portapak camera became accessible, performance artists started to use video as an extension of their bodies, creating work specifically for the camera, within their studio space (Bruce Nauman) or in relation to their bodies (Dan Graham). Video, able to capture and ‘immortalize’ their performances, was subsequently presented as the artwork. Other performance artists look to video as documentation of their performance, a residue to be exhibited with other remaining artefacts. Now there’s something to sell. A good example would be Chris Burden, who recontextualized his work with a candid voiceover clarifying his intentions in his Documentation of Selected Works 1971-74 DVD. Interestingly Burden was entangled with a case where his student wanted to re-enact his controversial Shoot piece. With the advent of technology, video documentation of performance has been more readily available on the Internet, saving us the trouble of finding them in distant libraries or obscure rental shops. At the same time, these videos reach a far wider audience then ever before. Chris Burden’s video of Shoot has 129,152 views on YouTube. This commodification of documentation makes it possible for Art to be consumed like fastfood, on the go, without much thought, possibly cheapening the experience of the Now or the Event. This portability was commented upon by a recent group show Performance in Frames held at the Substation Gallery. It presented video performances on small portable screens strapped onto SBOs (army harnesses), that hung at the gallery during the weekdays and donned by volunteers during the weekend for the public viewing. These performances, made exclusively for the camera, are now literally on the go, stripped of their original context. In 1977, for the very first time, Nam June Paik, together with Douglas Davis and Joseph Beuys broadcast their blockbuster performance to over 25 countries as part of Documenta 6. This redefined performance art, fusing music, performance, video and television in an homage to global communications. Now with quick advancements in technology, it is made simpler and more economical to broadcast performances live on the Web. The Tate Modern in London has realized this potential space with the Performance Room, launched recently with Jérôme Bel’s performance on the 22nd March 2012. On the YouTube page, it’s mentioned, “each month a performance is captured on camera as it happens, from an undisclosed location at Tate Modern. The only way to see it is to watch online.” Here, they have totally eradicated the live present, audience, making it to be purely received by the anonymous worldwide audience, who provide their feedback in the post-show dialogue via twitter. This has many implications: the artist has no audience to react to in the moment; he performs solely for the camera. It becomes staged and highly rehearsed and choreographed for the camera – Jérôme Bel revealed that he didn’t want to have large movements that were hard to be documented or broadcast so he opted for a straightforward approach. During the performance, Jérôme entered this flat plane of a room (above), stood in front of a wall; a single camera captured him straight on, alternating between wideshots and midshots. This new medium has brought about new constraints, limiting the potential movements of the artist and losing the immediacy of being there. What if it was a video being recorded beforehand, how do we know that it was live? Is this still performance art, or simply documentation? So how instantaneous is it? In reality, the only difference is that this documentation of the performance reaches the audience immediately. However, this online platform still limits the response, not making it possible for virtual boos or applause, even if they were typed/tweeted, the artist wouldn’t know, and it would be delayed. Unlike Skype where both parties could see each other, a live broadcast falls short of the “live” experience. Ultimately, the experience is highly mediated and problematic. As performance artists grapple with this new avenue for art making, they have to be aware of its limitations and contradictions. As we look back at Cane, it was necessary for the performance to be documented, to form a seventh account. It’s documentation further complicates the case of Brother Cane, creating new iterations, eroding the original. Cane would have worked well if it was broadcast live, due to its pre-determined structure and intentions. Jérôme Bel’s work however, seems contrived. It doesn’t really add to the discourse. It’s just another performance, albeit one boasting of new capabilities. Zihan reconstructed a moment with documentation while Jérôme reconstructed his work for documentation. That being said, performance art is now is at our fingertips. This new digital platform presents many challenges to art if not treated properly. It creates a new generation of audience who passively sit in front of their computers, waiting for something illuminating to happen.